So Brendan Rodgers’ Celtic side have beaten the odds, jumped the hurdles, and dodged every pitfall trap on the way to the Champions League group stage. While bloated entities like the English Premiership enjoy five spaces in this season’s Champions League (some of which require no prior qualifiers), the ‘smaller’ leagues in Europe, of which the Scottish Premiership is deemed to be, need to endure a farcically long-winded qualification schedule. Let’s recap. As early as July 14th, Celtic’s campaign began. They were pitted against Linfield of Northern Ireland and overcame them in style, despite most other clubs up and down the country having barely started their pre-season. Next up, the sleeping giant of Rosenborg. Historically Norway’s elite club, and Champions League regulars. Up until 2002, they were the most consistent qualifying team for the group stages, having managed to get there eight seasons on the bounce. They’ve recorded wins over Borussia Dortmund (away) and Real Madrid in the not too distant past, but now also must endure an arduous qualifying process. Celtic overcame Rosenborg on this occasion, and were then handed a final qualification tie against Astana of Kazakhstan, who were also swept aside. No mean feat, but what happens next? How can it be that a club like Celtic have to work through six matches, early in the season, against other champions of their respective leagues, culminating in a 6,500 mile round trip to Kazakhstan; while a club like Tottenham Hotspur (who didn’t win their league) sail straight through to the group stages? You’d think that after having battled through the qualification process, all clubs who reach the group stages would be on a level playing field. But you’d be wrong. Thanks to the seeding system, the majority of the teams who find themselves in Pot 4 for the group stages will be nothing more than also rans as a result of being drawn (by design) against far superior teams. Put simply, the seeding system, no matter how you tinker with it, makes no sense at all. Take this year’s proposed pots for example. Pot 1 includes clubs like Spartak Moscow and Shakhtar Donetsk; while Pot 2 includes the likes of Barcelona, PSG, Borussia Dortmund, and Manchester United. Are we really saying that a club like Spartak Moscow should be carrying a bigger billing than a club like Barcelona? The obvious comeback to that line of argument is that both Spartak Moscow and Shakhtar Donetsk are champions, while Barcelona and Dortmund are not; but the inconsistency there is woefully transparent. If being the champions of your nation carries more clout for Spartak and Shakhtar, then why do we still find teams like Celtic, Feyenoord, and Maribor (who are all champions) in Pot 4? Last season, the Europa League was a better tournament to watch than the Champions League (beyond the group stages at least). Clubs like Ajax, St Ettiene, and Manchester United brought a freshness to the viewing audience, while the Champions League was nauseatingly predictable. The same clubs getting to the same stage in the same tournament, year after year. The ramifications of this are three fold. First off, the commercial viability of it will diminish over time. Apathy kicks in, and people become fed up with the repetition. Yes there will always be barrel loads of cash in the Champions League, but what happens if the viewing figures start to dip? How do you explain that to a Heineken or Gazprom who are ready to sign a seven figure sponsorship deal? The next consequence is that the same handful of teams will keep qualifying from the group stage, and will keep winning the tournament. Again, not good for the neutral, the sponsors, or anyone who has anything to do with clubs who find themselves in Pot 3 or 4. Can you really imagine anyone beyond Real Madrid, Bayern Munich, Barcelona, or PSG winning the Champions League in the near future? Are the top clubs in Pot 1 and 2 because they do well in this competition? Or do they do well in the competition because they are consistently in Pot 1 and 2? By consistently putting these clubs in Pot 1 and 2, you’re effectively guaranteeing them a larger financial boost every year as they have a far greater chance of going beyond the group stages. This financial boost allows them to strengthen more than the lesser teams in the competition, which in turn gives them even more of an edge competitively, and perpetuates them reaching the latter stages, and continuing to benefit financially. This cycle is unbreakable while the seeding system remains in place. The final consequence comes by virtue of the above, and is that the gap between the elite clubs, and those in Pot 4 will continue to widen. Celtic’s qualification this season will net them in the region of £30m, which is huge for a club in Scotland. However, by way of having to negotiate six matches to get there, there’s no guarantee for club’s like Celtic that they’ll reach this stage in the competition every year. Bagging yourself £30m every other season is great, but how does it stack up against the elite? Across prize money and the market pool value, Real Madrid and Juventus earned upwards of £90m from last year’s competition. Anyone reaching the quarter finals can expect to take home double the amount that Celtic picked up for qualifying. If a club can bank on at least £60m from the competition alone, year on year, it puts them light years ahead of the also rans, and plays a major factor in attracting big name signings, lucrative sponsorships, and increased media/broadcasting coverage. The top end clubs are sailing off into the distance, and will be out of sight if things don’t change. So what’s the solution? Easy. Get rid of the seeding system. We, as the Champions League audience, have been conditioned to accept the seeding system. We accept it because it’s how things have always been, but if the Champions League is to be a force for good, this outdated approach to fixture arrangement needs to go. A fully unrestricted, open draw would breathe new life into the competition, and put all 32 clubs on an even financial footing over time. This season, for example, we could see a group with Chelsea, Juventus, Bayern Munich, and Real Madrid thrown in together. Potentially two giants of European football would crash out early. Conversely, you could also see a group of Celtic, Sporting Lisbon, Maribor and Basel. For once, two of the ‘smaller’ clubs in this example would reach the latter stages of the tournament. A club like Maribor could end up earning £60m+, which would transform the competition in the long run. Your traditional Pot 4 teams would have the financial muscle after a few seasons to compete for the signatures of the very best players. Instead of three or four clubs being in with a chance of winning the big cup, we could be talking about 10 or 12. Unquestionably, European football is worse off for the absence of sleeping giants like Ajax, Celtic, Liverpool, AC Milan, and Hajduk Split in prominent positions, challenging for European silverware. By breaking the financial and structural stranglehold, the resurgence of these types of club would be facilitated, all in the name of fairness. Over the last few seasons, we’ve seen clubs like Manchester City actually doing a two-for-one promotions on Champions League tickets; while Champions League tickets for Celtic Park are like gold dust. What does that tell you about the stature of these clubs in real terms? With no detriment to the tournament itself, every season would be fresh, and the clubs who find themselves rewarded would be the ones who are run most efficiently. Success breeds success, both on and off the pitch. A few seasons of good performances in the Champions League would do wonders for the domestic leagues of countries like Scotland, Belgium, Norway, Denmark, and Sweden. Moderate success in UEFA’s flagship competition has a knock-on financial effect on the domestic scene as a whole. Ultimately, smaller leagues would become a more attractive proposition for top stars, broadcasters, and sponsors. European football turned on its head, and all with something as simple as scrapping an outdated and inequitable system. In the immediate aftermath of FIFA flexing their muscles on their long-held stance against ‘political’ slogans or logos being displayed on football shirts, the irony of getting angry about the use of the poppy in the sport remains lost on some. The seemingly straightforward decision to either allow, or block the use of the poppy on football shirts in the upcoming England vs Scotland match has lit a powder keg in terms of emotional response from both sides of the argument. The question is, have FIFA made the correct call, and will there ever be a clear line of segregation between politics and football in the UK? The emblem, intended as a mark of respect for those lost in WWI, has evolved into a cause of much controversy in football and across the mainstream media, much to the dismay of those closest to the genuine issue it’s intended to highlight. Without delving too much into both sides of the argument, we should all be in agreement as civilised adults that getting passionately angry either way completely undermines both sides of the argument. Finding yourself vexed about something that’s there to show respect, is ironically disrespectful; and being staunchly against it to the point of exasperation because you view yourself as a pacifist, is deeply hypocritical. Contributions from those who cannot articulate a calm and reasoned argument for or against such things is unwelcome. That said, FIFA’s latest input is at best inconsistent, and at worst, frighteningly ignorant. The governing body of the sport we all love have made their stance clear with regard to the clash with the auld enemy; but why stop there? One could be forgiven for assuming that FIFA haven’t bothered researching the issue at a domestic level in the UK, as they’ve stopped well short of taking a stance on it. Whether you think the poppy is a political statement or not is besides the point. FIFA have deemed it as so within the confines for the upcoming England v Scotland match, but how can the same type of display and subject matter be ‘political’ for an international match, but not a domestic one? Several English Premier Division clubs, as well as Rangers and Hearts in Scotland make no secret of their Armistice Day tributes, but other clubs stay well clear of the issue. It’s not for anyone to say definitively whether taking part or abstaining is morally correct. It’s respectful and correct to allow people to mark the day as they see fit, not to ram the issue down their throat. What’s not correct is the muddled approach from FIFA, and the media witch hunt which has emanated from something that was originally intended to be mannerly and deferential. Theresa May’s announcement that non-poppy wearers should be “named and shamed” does nothing but fan the flames of hatred. With all the problems that we face in the UK today, surely the poppy debate should be put on the back burner in Westminster? FIFA too aren’t free of blame here. Their scattergun approach to these types of displays is typical of the disarray that mires the organisation. Their flip-flopping on the Irish Easter Rising display bewildered many fans, and where does it stop? Pyrotechnic displays incur fines sometimes, but not others. Carrying Palestinian and Israeli flags also can incur punishment inconsistently. Then there’s issues like racist chanting, which still falls under the radar in some countries. No wonder there’s confusion over what is, and what is not acceptable. It’s a multi-faceted issue. People will continue to be passionate about matters that not everyone will always agree with. Unless there’s strong governance over to which extent political and religious messaging can interfere with football, then we’ll forever be stuck on this perpetual merry-go-round, debating the same handful of issues as and when the mainstream media see fit. What I can’t understand is why the issue of poppy display (and others like it) tends only to be contentious in football. Rugby, tennis, baseball, golf, basketball, athletics etc all seem to be free of this. There’s no one right answer, but football in Scotland and England seems to be as much about political messaging and antagonistic behaviour as it is about the sport itself. A blanket acceptance, or outright ban feels like the only way to put the issue to bed, although the execution of either could invoke yet more negative feeling. If people could make a unified effort to keep their political opinions to themselves for 90 minutes, maybe we could enjoy the sport a little more. Who knows, it may even help to turn the UK government’s focus not towards an atrocity from over 100 years ago, but to the issues which cripple us today; unemployment, privatisation, current global conflict, poverty, and inequality. An uninspiring 2-2 draw for Celtic at Tynecastle has kept Aberdeen in the Scottish Premiership title race, and further added to the moans and groans from the Celtic support with regard to the leadership qualities of current manager, Ronny Deila. Osman Sow’s late strike secured a point for Robbie Neilson’s Hearts side, as Celtic blew the chance to go 3 points clear of Aberdeen in 2nd place. This latest disappointment means the Bhoys have won just 3 of their last 9 matches in all competitions, with growing discontent at the style of play on show. Just a few seasons ago, David Moyes was one of the emerging talents in European football management. His no-nonsense style was well respected in the English Premiership after a successful spell at Everton. When Sir Alex Ferguson hand-picked Moyes as his successor at Manchester United, it looked as though the Scotsman was on the verge of becoming a blue-chip manager of sorts. Moyes fell victim to a transitional period of low resource and high expectation at United. He was dismissed less than a season in, despite having a better record both domestically, and in Europe than Louis Van Gaal (with considerably less money spent on transfers). A shock move to Real Sociedad was next for Moyes. He took the reins with the club in 15th place in La Liga. After an initial upturn in fortunes at the club, form began to stagnate. Communication was touted as a problem by those at the club, with Moyes not being able to speak Spanish. With Sociedad sitting comfortably in mid-table, Moyes was relieved of his duties. A win % ratio of just 28% at the Basque club was deemed unacceptable. Something of a surprise addition to the list of candidates, the former Motherwell midfielder has yet to set the heather alight in his management career, but has gained enough experience to be a contender for the Parkhead hot seat across various management positions. With a working knowledge of the Scottish game, international experience, and connections south of the border, McAllister is the polar opposite of current Hoops boss Ronny Deila. This shift in focus could be appealing for the club, particularly to boost the opportunities in the transfer market. McAllister’s first stint in management came back in 2002 when he was appointed player-manager of Coventry City. He lasted just over a year and a half in the job, before resigning to spend more time with his family. A four year sabbatical ensued, before he returned to management on a temporary basis as Leeds United manager. With the club then playing in the third tier of English football, McAllister turned things around magnificently, taking the Yorkshire club from 8th, all the way to the playoff final. A poor start to the following season led to his departure in December 2008. Since then, he’s taken up various coaching positions, at Middlesbrough (working alongside former Celtic manager, Gordon Strachan), as Assistant Manager at Aston Villa (under Gerard Houllier), and First Team Coach at Liverpool (as part of Brendan Rodgers’ coaching staff). Another potentially surprising name to be thrown into the hat, Iain Holloway would certainly liven things up at Celtic Park. His relentless attacking style has brought him mixed fortunes in management, but would at least win favour among the fans at Celtic. The majority of Holloway’s career has been spent managing clubs in the English Championship, with his most famous success being when he propelled relegation-touted Blackpool to the dizzy heights of promotion to the English Premier League in 2010. After a whirlwind adventure on a shoestring budget, Holloway’s side went down fighting on the last day of the season. The outspoken manager almost pulled off the impossible again the following season, taking Blackpool to the playoffs, and narrowly missing out on promotion back to the Premiership. After Blackpool, Holloway took over at Crystal Palace in 2012. Things started well with a 5-0 win over Ipswich, and continued to go smoothly as he again managed to promote the club to the English Premier League. Things turned sour quickly after just 8 matches in the Premiership. Holloway came under pressure from the fans after amassing just 3 points in this time, and left by mutual consent. His latest managerial position came in January 2014 when he signed a 2 and a half year deal to become Millwall manager. He was initially tasked with saving the club from relegation from the Championship, which he achieved by finishing 19th, 4 points above the drop zone. The 2014-15 season didn’t go so well, and Holloway was sacked for the first time in his career in March 2015. Never far from the hearts and minds of the Celtic fans, Henrik Larsson will forever be idolised at the club. A section of the support backed Larsson for the Celtic manager’s job before Deila took over, and you can bet that should Deila be relieved of his duties, the super Swede’s name would be mentioned again. Sentimental appointments rarely work out in modern football, but rarely do we see a player idolised so exclusively as the way Larsson is at Celtic. Larsson’s appointment would certainly unite the fans and bring back a buzz straight off the bat. The respect he’d command in the dressing room could only be a good thing, and his reputation across Europe could open doors in the transfer market. That said, Larsson is relatively new to the management game, and his inexperience could be a major risk. In December 2009, Larsson took his first management role, at Swedish 2nd Division outfit Landskrona. In his first season, he took the club to the brink of promotion, finishing 5th, and adopting an attractive 4-3-3 attacking style of play. His 2nd season was something of a disappointment, with the club sitting bottom of the league more than halfway through the season. A positive run of results propelled the club up to 10th, but the fans had expected promotion. Larsson stayed for a third season, but could only manage a 6th placed finish, and resigned shortly afterwards. A short stint at newly promoted Falkenbergs in the Swedish top flight followed. Larsson managed to keep the club in the top division, but left after one season to take the top job at his former club, Helsingborgs, where he remains to this day. Larsson has previously admitted that he would like to return to Celtic some day as manager, but whether or not that day will be anytime soon remains to be seen. One of this year’s biggest stories in international football is the rise and rise of Northern Ireland under Michael O’Neill. The former Hibs player has transformed his home nation from footballing minnows, to a formidable force who qualified comfortably for the Euro 2016. O’Neill has a great working knowledge of Scottish football, having played for Dundee United, Hibs, Aberdeen, St Johnstone, Clydebank, and Ayr United. With Celtic being unable to attract a blue-chip or English Premier League manager, rising stars like O’Neill could be the club’s best bet to delivering sustainable success. The Northern Irishman’s managerial CV is a short one, with just over a season at Brechin City under his belt, he left for Shamrock Rovers in 2009, where a modicum of success ensued. O’Neill took the Rovers to 2nd place in the league in his first season, and won the league in his second season. Another league title ensued in 2011. He also guided the team to win the Setanta Sports Cup in 2011, and recorded a notable victory over Partizan Belgrade that same year. O’Neill’s biggest achievement by far has been the work he’s done as manager of Northern Ireland. With an average group of players at his disposal, he’s taken the nation to their first major tournament in 30 years by qualifying for Euro 2016. They topped a group containing the likes of Romania, Greece, and Finland, losing just 1 match in the process. O’Neill’s success hasn’t gone unnoticed, with several English Championship clubs sniffing around him already. He’ll clearly want to reap the rewards of his efforts by managing the Northern Irish side at the finals in France in the summer, but beyond that, it’s expected that he’ll move on while his stock is high. With O’Neill being potentially unavailable until the summer, the timescale could work out well for Celtic, as Ronny Deila would still have enough time to prove himself as a success. Deila will continue to come under fire until Celtic start to win, and win in style. The next few months could be crucial for the club either way. Time for Ronny to shape up or ship out. While the likes of Asda and Tesco are big on customer loyalty, I’m not sure Celtic should continue to collect their Dundee United Club Card points by securing the services of Nadir Ciftci. After snapping up Gary Mackay Steven and Stuart Armstrong from Tannadice not so long ago, Ronny Deila has again turned his head to Tayside, and tested the water with a £900k bid for United’s leading forward. The big Turk found the net 14 times in the league last season, and has been a popular figure at Dundee United since his move to Scotland, which was brokered by Celtic favourite, Pierre Van Hooijdonk in 2013. With a graceful touch and an eye for goal, it’s easy to understand why Ciftci would flag on the Parkhead club’s radar, but many players do, and not all are a natural fit at Celtic. While acquiring the Scottish Premiership’s 2nd top scorer from last season may sound like a reasonable idea in some respects, I believe the negatives of the move far outweigh the positives, and Celtic should look elsewhere. 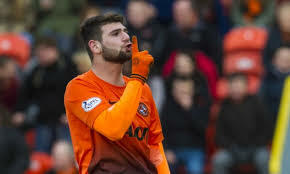 First off, by playing at Dundee United, Ciftci is granted a certain attacking freedom that just doesn’t come when you’re a Celtic striker playing in Scotland. He’s spent the last 2 years playing against teams who fancy their chances against Jackie McNamara’s side, and as such, will defend high up the park, leaving space to run into. Celtic strikers are seldom granted the same allowance, as Ronny Deila’s frontmen find themselves breaking down sides playing with five defenders, packed deep into their own penalty area. Ciftci could potentially have a modicum of success, but is he any better than the current crop of Celtic strikers, all of who are considered ‘not good enough’ by large sections of the support? Is Ciftci more gifted than Anthony Stokes? Or Leigh Griffiths? It’s questionable. Some would even highlight the likes of Teemu Pukki as a comparison, who arrived with over 30 international caps, and a Bundesliga pedigree, only to flop in the East End of Glasgow. Ciftci’s disciplinary record and inconsistent form are also a cause for concern. A reputation for petulance, as well as an incident where he grabbed a referee by the throat, and also allegedly tried to bite an opposition player, will hang over his football career for the next few seasons at least. Celtic have probably hit the nail on the head with their initial bid of £900k in terms of establishing the correct value of the player, but the Tayside club rejected this offer. Should Celtic wish to acquire the player, they’ll need to go well over the £1m mark. The issue is complicated further, as Middlesborough have expressed an interest in the player. Is it wise to get involved in a bidding war with a club who’ll be pushing for promotion to the English Premiership this season? A £3m flop at Middlesborough would soon be forgotten about, but a £3m flop at Celtic would live long in the memory of the fans, and would seriously dent the club’s transfer budget. The move would also be bad for the neutral fan in Scotland too. The Scottish domestic league is enough of a foregone conclusion as it is, without stripping Dundee United of their one remaining flair player. With no Rangers in the league again this year, Celtic will cruise to the title. Aberdeen can’t be expected to replicate the heroics of last season again this year, and if Celtic snap up Ciftci, Dundee United will have lost their top three players, all to the Parkhead club, in less than a year. Ronny Delia’s task is not easy. He must continue to entertain the fans, develop players, balance the books, and give a decent showing in Europe, all on a shoe string budget. Although Celtic cannot afford to throw £10m+ to obtain what the media would call a ‘Champions League striker’, they can look to develop younger players to reach that level. Few people would argue that Ciftci has the potential to be a ‘Champions League striker’, so Deila must resist the pressure to make snap judgements in the transfer market, and patiently wait for the right player to emerge amid the furore of the transfer window. As Thomas Muller’s looping header sailed over the head of David Marshall and nestled into the back of the net after just 18 minutes at the Signal Iduna Park in Dortmund, The Tartan Army could have been forgiven for thinking a hiding was about to ensue. What happened next was truly remarkable. A wounded Scotland side were galvanised. Facing a German World Cup-winning side who steamrollered past everything in their path in Brazil, the Scots matched their opponents, and delivered a performance that made Joachim Lowe’s side work much harder than they’d ever have anticipated. A stunning equaliser from Ikechi Anya set the cat among the pigeons, and at one point Scotland even looked as though they’d go on to win the match. The pressure finally told, with 20 minutes left on the clock, as golden boot winner Thomas Muller bundles home the winner. With the likes of Allan McGregor, Matt Gilks, and Craig Gordon breathing down his neck, David Marshall should draw confidence from the fact that Gordon Strachan has once again handed him the no.1 jersey. Sadly for Scotland, this confidence seems in short supply. Marshall has come a long way since he was given a baptism of fire, being thrown on at half time as a young boy for Celtic against Barcelona. He’s cut his teeth for many years in the English Championship, and won many plaudits as he kept Cardiff in with a fighting chance of staving off relegation from the English Premiership last year. Despite coming such a long way, Marshall still shows a worrying lack of confidence and fails to command his area adequately. He was always going to have a busy night against the world champions, but he did himself no favours after being beaten by a looping header early on that caught him flat-footed. A string of world-class saves followed from Marshall, in the first half, and the second. As much as this undoubtedly redeemed his early mistake, it must frustrate the manager, knowing that his goalkeeper is so close to having the whole package. Marshall rarely looked troubled by anything the Germans had to throw at him in terms of shot stopping, and could do little to prevent their 2nd goal. However, the former Celtic ‘keeper looked shaky from cross balls, and seemed to be happiest when his defence were organising themselves, rather than when he was forced to reprimand them at any time. Hitthebyline Rating – 8/10: Football is a cruel game. Marshall made one mistake against the world champions, but was made to pay for it. A lesser goalkeeper would have conceded 3 or 4 on the night. The only person Marshall needs to convince that he’s a world class goalkeeper is himself. If Marshall can convince himself he’s a world class goalkeeper, he’ll be an asset to this campaign. If not, then someone else will receive the no.1 jersey, sooner rather than later. Attacking line-ups don’t come any more formidable than that of Germany. André Schürrle, Mario Gotze, Marco Reus and Müller tormented the Scots back 4. Alan Hutton, Russell Martin, Grant Hanley and Steven Whittaker faced the most formidable of opponents, but in most respects, did as well as could be expected. Collectively, they fought hard, held shape, kept their cool, and threw themselves infront of shots and crosses from the first whistle until the last. Strachan clearly values pace in his side, particularly on the flanks. This is probably why we’ve seen so much of Alan Hutton, and on Sunday night’s form, he looks like the correct choice. Never a player with a great deal of finesse, but Hutton’s ability to get from box to box at pace is invaluable to the team. He rarely looked out of place from start to finish. Martin and Whittaker did well, without doing anything spectacular. A disciplined performance will be what was asked of them, and very few people would argue that they didn’t deliver that. Grant Hanley seems to be a player that divides the Tartan Army. For the most part, a hard-working, no-nonsense defender, but at times his lapses in concentration seem to lead him into trouble. 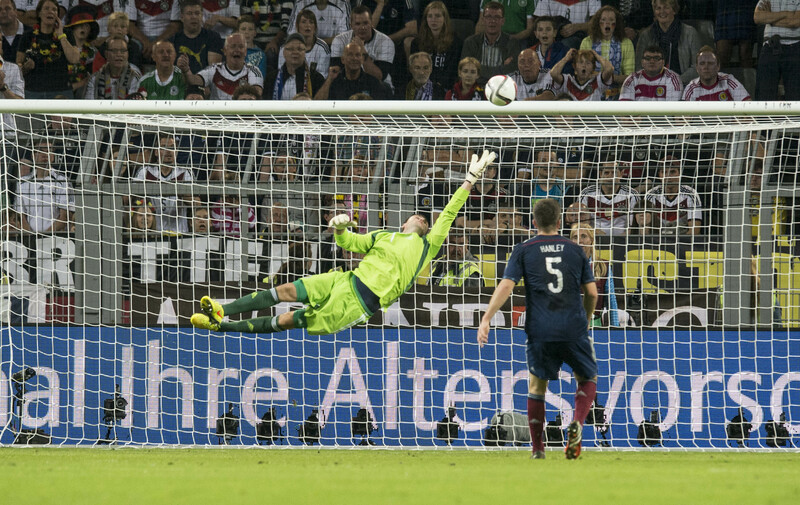 Hanley’s tendency to give away needless fouls or be caught out of position has costed Scotland in the past, and continued to cause problems against Germany. Hitthebyline Rating – 7/10: The central defensive partnership for Scotland has been a pain point for many years, and it doesn’t quite look as though it’s been cracked just yet. Strachan has his side well-drilled, but if there’s one area of the field the side could do with strengthening, it’s in the centre of defence.In terms of the performance against the Germans, there’s not much to complain about. The work rate was correct throughout, and the discipline was good for the most part. If Scotland were going to contest the game well against Germany, a strong midfield performance was required. This was delivered overall, but the diversity in performance standard was more apparent in midfield, than in any other area of the park. 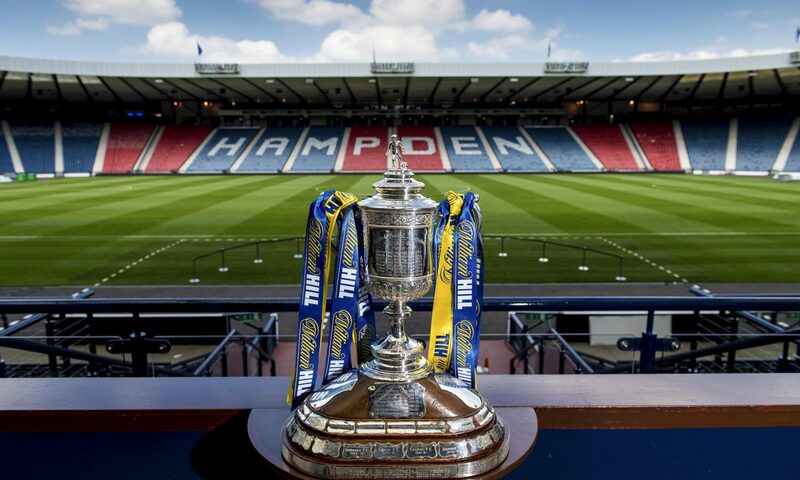 Ikechi Anya, James Morrison, Charlie Mulgrew, Darren Fletcher, and Barry Bannan lined up in an unusual midfield 5. It hasn’t taken Ikechi Anya long to establish himself as a firm fans favourite. With only a handful of caps to his name, he’s already bagged a few goals, and never fails to get the fans up off their seats. In that respect, It was business as usual for Anya against Germany. The Watford wing-back was the standout Scot on the field. He covered every blade of grass for the full 90 minutes; battling hard against the German attackers, passing & moving well, skipping past German defenders, and running more than half the length of the park to slot home a well-earned equaliser. Anya’s passion, skill, energy and pace are unparalleled in the Scotland squad. Whether Scotland qualify for Euro 2016 or not could be in no small part, down to the form of Ikechi Anya. James Morrison spent much of the game chasing shadows. He is unquestionably a dogged, hard-working midfielder, but looked a little over-awed by the occasion at times. Instances of slack-passing and poor decision making were peppered throughout his performance, but Morrison remained resolute, and continued to work hard. Celtic’s Charlie Mulgrew looked out of sorts from the first whistle to the last. I’m not sure what’s happened to the experienced dead-ball specialist over the summer, but for whatever reason, the player’s form has dropped drastically. Mulgrew looked sluggish, and couldn’t keep up with the pace of the game. His distribution wasn’t up to its usual standard, and moments of frustration crept in, which ultimately led to a yellow, then red card. Not a good night for Charlie. The return of a natural leader like Fletcher buoyed the support, and this definitely had an effect on the team. The Manchester United man looked a cut above the rest. He was composed, fearless in the challenge, and sprayed passes around with ease. Fitness still seems to be an issue for Fletcher, as he was subbed off for James McArthur in the second half, but the fans will have seen enough to unanimously agree that Fletcher will be one of the first names on the team sheet for the foreseeable future. Busy doing nothing would be a fair summary of Barry Bannan’s evening. Always running? Yes, but never any end product. Bannan has unquestionable talent, but for some reason, the Scotland fans have yet to see the best of it. At just 24, there is hope that he’ll mature into a big game player for his country, but if his first 18 caps are anything to go by, this maturity could be some way off. The Crystal Palace midfielder succeeded in making a nuisance of himself against the Germans. An abundance of pace serves him well, but a tendency to be caught in two minds seems to crop up more often than Gordon Strachan would like. Another so-so performance by Bannan saw him hooked for Wigan’s Shaun Maloney. Strachan does seem to have faith in the player, but there will come a time when he’ll look for this faith to be repaid. Hitthebyline Rating – 8/10: Stunning performances from Anya and Fletcher were juxtaposed with Mulgrew’s miserable showing. Bannan and Morrison had decent enough games, but could have done so much more. Scotland have plenty options in midfield, with McArthur and Maloney pushing for a starting place, as well as the likes of Scott Brown and James Forrest on the road to recovery.The players Strachan has at his disposal in this area of the field have experience at the very highest level, and could be hugely significant for the Euro 2016 campaign. …or, forward, as the case was against Germany. Everton’s white-hot Steven Naismith had the unenviable task of being the lone striker against a usually water-tight Germany defence. The ex-Kilmarnock and Rangers frontman didn’t disappoint. Naismith has slotted in seamlessly to replace the tireless runner that was Kenny Miller. His work ethic was exactly what was required to cause problems against Germany, and the striker was unlucky not to get on the scoresheet in the second half after snatching at a few chances. Naismith has developed well over the past few seasons, and with a little more exposure in the English Premier League, should continue to improve. Strachan made the decision to switch Naismith for another English Premier League-based Scot, in Steven Fletcher. Fletcher lived up to his exorbitant price tag, making an immediate impact to slot a beautifully weighted pass through to Anya for the equaliser. Fletcher’s physical edge boosted Scotland’s attacking options. The big striker fought hard in the air, and held the ball up well for supporting midfielders, but could do little to reverse the fate of Strachan’s men on the night. Hitthebyline Rating – 8/10: Both Naismith and Fletcher were terrific. They battled hard against superior opposition, and were unlucky to come away on the losing side. With Naismith’s terrier like pressing of the ball, and Fletcher’s physical, yet intelligent play being at the disposal of Scotland, the real shame was that both players didn’t get the chance to play together against the Germans. Scotland have very little else to call upon in the striking department beyond these two players but their commitment and ability will serve their country well on the quest towards Euro 2016 qualification, and beyond. So Neil Lennon’s reign at Celtic is already a distant memory, and with the Champions League qualifiers just weeks away, the Parkhead faithful nervously await the announcement to unveil his successor. Several names have been batted around – Owen Coyle, Henrik Larsson, David Moyes, Malky Mackay, and Michael Laudrup to name a few. There seems to be no obvious choice lying in wait to take over from Lennon. It looks like even the bookies are somewhat in the dark on this one, but if their current favourite, Roy Keane ends up landing the job, I fear that the Celtic board may have made a grave error. 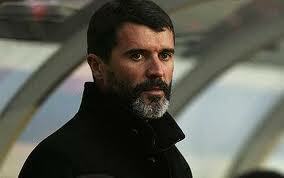 There have been few more fiery and controversial characters in British football than Roy Keane over the past 20 years. Undoubtedly a world-beater of a player at his peak; but the Irishman became a figure of ridicule throughout the twilight of his playing days, and arguably more so into his management career. Celtic pride themselves on cultural acceptance, sportsmanship, and a positive moral flamboyancy from the support. Does Keane fit the mould to carry on these traditions? His well-documented instances of emotional spontaneous combustion would indicate that he doesn’t. Amongst other things, Keane walked out on his country during the World Cup, walked out on Manchester United after a disagreement with the man who made him, and ended Alf Inge Haaland’s career with a tackle that can only be described as savage. Do Celtic really want a man who condones this thuggish behaviour to be calling the shots at the club? I’ll give Keane his due. During his first season as manager at Sunderland as manager, he did well. He took the club from 2nd bottom in the Championship, to end up winning the league, all in one season. Just as things were looking good for the current Republic of Ireland Assistant, he continued on a phenomenal spending spree from the previous season, assembling a huge squad in a less than frugal manner. In total, he spent over £75m in just over two seasons, adding 39 players to the Sunderland roster. How would a manager that spends so recklessly cope with stringent budget of around £5/6m per season at Celtic, bearing in mind that a £3m outlay on a player that doesn’t turn out to be a first team regular is considered as a catastrophe? Keane’s demise at Sunderland came about thanks to a 7-1 skelping at the hands of Everton, a 4-1 trouncing by Bolton, a 2-2 draw with Northampton, and a run of five losses from six Premiership games. Keane managed to shoe-horn in a spat with the FIFA Vice President Jack Warner, (calling him “a clown”), a fall out with club chairman Niall Quinn, and a war of words with majority shareholder Ellis Short, before eventually resigning, leaving Sunderland languishing in 18th position in the Premiership. The Irishman was out of the game for just two months before taking over as manager of Ipswich with a view to guiding them back to the Premiership. A series of weak signings, including Martin Fulop, Grant Leadbitter, David Healy, and Daryl Murphy scuppered any hopes of the Tractor Boys making it back to the big time. Keane’s side managed to draw an astounding 20 matches in the league, which saw them finish in 15th place. His next (and final) season saw things go from bad to worse. In a season where the club were expected to challenge for promotion, Keane guided them to a lowly 21st place, sitting behind the likes of Doncaster Rovers and Barnsley, before he was sacked in December of 2011. Keane had been out in the managerial wilderness since then, before Martin O’Neill appointed him as Republic of Ireland’s Assistant Manager. In his only two experiences as a club manager, his record compares unfavourably against the likes of Steve Bruce, and Peter Reid at Sunderland (Premiership), as well as Joe Royle, and Jim Magilton at Ipswich. He has no experience managing in Scotland. He has no experience managing in Europe. He has no experience working on a tight budget. When we factor in all these things, it’s hard to imagine how his name is in contention for any job, let alone the Celtic hotseat. Who knows which way Celtic will turn as they seek Neil Lennon’s successor. They have plenty of options at their disposal, but if they want to continue a tradition of success, financial prudence, and universal appeal, then surely Roy shouldn’t be the bhoy for them. Was David Moyes Doomed from Day 1? Any last lingering doubts that David Moyes would continue as manager of Manchester United were quashed in one fell swoop, as the news broke this morning that the Scotsman would be relieved of his duties, just 10 months into a 6 year contract. United fans were quietly confident when Moyes replaced the seemingly untouchable Sir Alex Ferguson less than a year ago. Since then, pretty much everything that could go wrong, did go wrong; but to what extent can David Moyes be held directly responsible for what has been a catastrophic season? There were several key factors that made this season the worst in Manchester United’s Premiership history, not least of all, the tired looking squad of players that David Moyes inherited. From back to front, the Manchester United squad of August 2013 was weak. Both De Gea and Lindegaard look unconvincing in big games, while the back 4 continued to rely on players like Evra, Vidic and Ferdinand, who are well past their peak. Their famous midfield, once boasting the likes of a youthful Giggs, Keane, Scholes and Beckham; fell from grace, turning to Cleverly, Young, Nani and an ageing Carrick. In the striking department, they now cling to a want-away Van Persie, a hot & cold Rooney, and a bang average Danny Welbeck. To think that Sir Alex Ferguson guided that ailing squad to the Premiership title by a margin of 11 points isn’t so much impressive as it is miraculous. Had Fergie stayed on another season, would he be able to replicate this feat? I sincerely doubt it. United had been on the decline for several years, arguably since around 2009 when world-beaters like Cristiano Ronaldo and Carlos Tevez opted for pastures new. Any big signings since then (such as Van Persie) seemed to come out of desperation rather than as part of any great master-plan. David Moyes took the reins after around five years of chronic under-investment. His first summer transfer window needed to be a whirlwind of inbound activity. Perhaps around five or six world-class players on the right side of 30 were required to inject new life into United; but as we all know, it didn’t pan out that way. Leighton Baines, Cesc Fabregas, Mesut Ozil and Robert Lewandowski were all targeted, but Moyes’ United couldn’t table a bid enough close enough to wrestle these top players away from their respective clubs. Was this the fault of Moyes? Or did the Manchester United hierarchy believe that Moyes could continue to run Fergie’s threadbare squad on fumes? On transfer deadline day, Moyes delved into the transfer market to panic buy Marouane Fellani. In what proved to be a sign of things to come, the transfer was an expensive disaster. Fellani had served Moyes well at Everton, but since his £27.5m switch to Old Trafford, he’s looked clumsy, cumbersome, and out of his depth. Moyes could argue that if he’d been allocated a proper war-chest to turn the club around, he could have secured some of his A-list targets; but I doubt there’s anything he could say to defend the procurement of his one-paced afro-headed Belgian midfielder. With the first transfer window being written off as a failure in the eyes of the concerned fan-base, the next judge of Moyes’ credentials would be his choice in players to trust and invest in. Moyes came under fire throughout the first half of the season for not giving Shinji Kagawa a regular start, particularly when Van Persie picked up an injury. An ever-changing back four also seemed to lead to a lack of stability, so much so that the team’s form began to suffer. Perhaps the club’s main sellable asset, Wayne Rooney, was misfiring too. He struggled for fitness, made noises about leaving the club, and managed a haul of just 17 goals across the whole season (just 1 goal off his worst ever for United). Rooney could have been sold. It’d have been no surprise if he commanded a transfer fee of £30-40m, which could have been used to fund a bid to secure a striker on the way up. Instead, Rooney was offered a new 5-year contract, on a reported wage of £300,000 per week. Rooney understandably signed the contract, but his form didn’t noticeably improve. Instead of a waning Rooney on £300,000 per week, would the club’s needs have been better served by securing three top players on around £100,000 per week? Was Moyes in control during the Rooney contract talks? It’s hard to tell. One thing Moyes didn’t have (because let’s face it, only one man does), was the Fergie factor. Sir Alex’s uncanny ability to turn average players into world beaters, to upset the most astronomical of odds, and to make players fight for him with every fibre of their being is what makes him arguably the greatest football manager ever. Moyes was never going to live up to Ferguson’s legacy, but the manner in which he failed in terms of getting his players to fight for him verged on embarrassing. For whatever reason, Manchester United’s big players didn’t fight for Moyes in the same manner as they fought for his predecessor. Anytime a United side under Sir Alex lost, they’d go down with a roar. 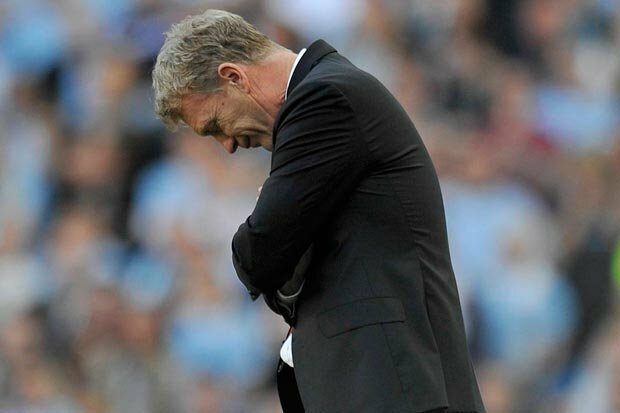 Under Moyes, all too often this season, they’ve gone down with a whimper. As the manager of such an illustrious club, Moyes must shoulder some of the blame for losing 11 times in the league, but Gary Neville poignantly defended him today when he referred back to his own playing days. True enough, matches are won and lost with players, not managers. United’s sluggish squad can have few complaints about finishing behind Manchester City, Chelsea, Liverpool, and Arsenal; but they should be asking serious questions of themselves when it comes to some of the losses they suffered against ‘lesser’ clubs. With all due respect to these clubs, should Everton (home and away), Stoke, Sunderland, Swansea, Spurs, Newcastle, and West Brom all be recording fairly straightforward wins over the Champions of England? Manchester United are stronger than all of these sides on paper, but they’ve all beaten United this year. Either the manager has been wildly inept with his tactics, the players in red shirts were failing to give 100% for the team, or a combination of both. The romantic notion of Manchester United staying true to the legacy of their most successful manager by allowing him to select another fiery Scottish manager as his replacement hasn’t panned out as planned, but in retrospect, it’s possible that Moyes’ sacking could be a mistake. The United hierarchy gained many a plaudit for choosing Moyes over a big name foreigner, and were also praised for repeatedly defending Moyes’ disastrous run of results by alluding to the fact the club were going through a reconstructive period. Where now for that patience from the board? It was only a year or so ago that Brendan Rodgers was being touted for the sack, now look at the transformation in his Liverpool side. The older Red Devils fans will remember Sir Alex’s woeful first season. Fergie’s neck was saved by a late goal to win the F.A Cup, and the rest, as they say, is history. Would it have taken something as frivolous as an F.A Cup win to save Moyes? Could he have gone on to rack up 20 years or so of glory? We’ll never know now. 10 months on, it turns out that the fans, the players, and the hierarchy have all disobeyed Fergie’s instructions. Today not only signals the end of David Moyes’ woeful time in the Old Trafford dugout; but it also signals the end of Manchester United’s long reign as the shining light of football clubs in Europe. The end of Moyes’ tenure will forever be pinpointed as the landmark moment when United steered away from the moralistic crusade of legacy building; and conformed to the hollow pursuit of financial gain through unscrupulous performances in bloated competitions where the wishes of the fans ebb ever further away from the ethos of the club.